I have a client who struggles with her filter. Shocking, I know. 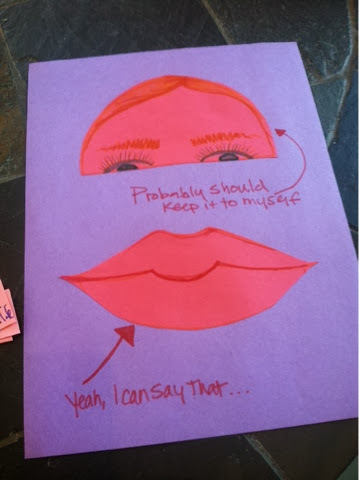 We created this simple visual, which prompts her to stop and think about where her words should go, or stay. The head and mouth were both pasted on the paper to create a pocket. I had my client find different items that 'filter' i.e. colander, towels, things with general holes in them..then we tried to 'filter' things through. What goes through? What stays put? I then cut out strips of paper and wrote phrases, possibly phrases I have heard her utter in the past, then prompted her with a situation, the phrase and were it should go. BONUS ROUND! She should take the phrase and give an appropriate alternative to stick in the 'mouth' pocket. This practice also provides a great phrase to easily re-direct in the future, i.e "should that stay in our head pocket?" I absolutely love this idea. I have a kiddo who struggles with where the line of I am joking and now I'm being rude or it's not appropriate to be sarcastic with this adult. This could probably be adapted to work well for that. Thank you, I have used the colander before. I this will extend the lesson on a more personal level. Sharing this on my Instagram account (speech2me). Love it!!! Thanks so much! Totally! Be on the lookout for an email from me by the end of the weekend!! Thanks for checking out our site! Could I have those prompts as well please? Could you also email me the prompts? Thank you so much! Could you send me as well? Hi everyone! I actually went ahead and created a post with them :) check out the main page to see them! Would you please send the prompts to me as well? mindbodyspirit7@gmail.com Thank you! Hi there! I actually created a post with them :) check out the main page to see them! Can do! I actually created a post with them :) check out the main page to see them! This is a great idea. As a school social worker, I have plenty of kids who do not understand the difference between what can be said aloud and what cannot. I like that this give me a visual for the kiddos! Would you mind sending the prompts to me please? This is a wonderful resource: thank you! (catherinejstone@yahoo.co.uk). No problem! I actually went ahead and created a post with them :) check out the main page to see them! Hi! Do you post the prompts anywhere, or would you email them to me? Thanks! I actually created a post with them :) check out the main page to see them! Hi can you please send it to me as well. Great idea! Would suggest the lips shown slightly open, like when speaking, as this picture can look like keeping one's mouth closed. Great idea!! will share with my colleagues..
LOVE this for "what the character is thinking and saying." Can't wait to incorporate this into our Character Unit of Study! Well Done! LOVE this for "what the character is thinking and saying!" This will work great during our Character Study Unit! Thank You! 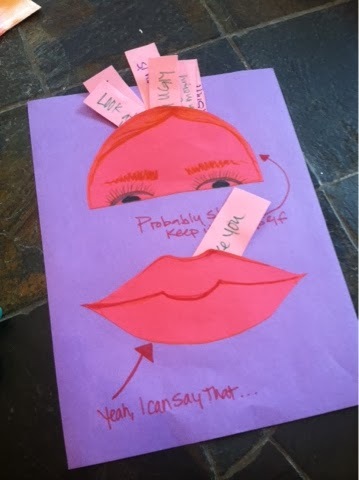 Would you be willing to share some of the prompts that you used for this intervention? I think this would be highly beneficial to use with my kiddos!